Mid-Excursion 6 is fully booked. Rokua National Park is a part of the wider Rokua Geopark area, which in turn is part of the Global Network of the National Geoparks supported by UNESCO. 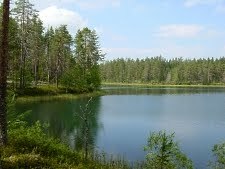 The unique and diverse landscape of Rokua was formed as a consequence of Rokuanvaara Hill rising as an island out of the sea after the Ice Age. Formed mainly of sand, the island was then sculpted by water and wind. Esker ridges like Rokua were born, when the glacier was melting around 10 000–12 000 years ago. The piled ridges are formed by the melting water flowing within and under glaciers. The kettle holes and lichen covered ridge mounds were made by slowly melting ice blocks pressing holes on the ground. 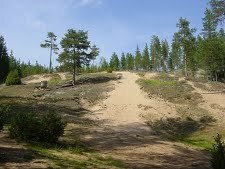 Rokuanvaara Hill has dry esker forests, which offer quite easy terrain for hiking. The Information Center Suppa is located right at the core of the Rokua Geopark. Rokua is one of the northernmost places where rare and threatened species typical for eskers can be found. 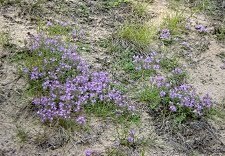 These species need sunlit sandy habitats, which naturally occur on esker slopes mainly during the initials stage of the forest succession and in sites affected by forest fires or other disturbances. As the result of effective control of forest fires and commercial forest management, many sunlit habitats in Rokua are now overgrown and wooded. Controlled burning of the forest in the site is not possible, but the sunlit habitats are being managed by clearing of trees and saplings and exposing mineral soil. Management of sunlit habitats is done in esker forest that have recently been in commercial use. 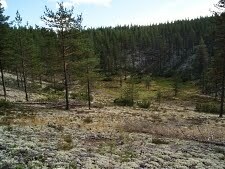 In the oldest parts of Rokua National Park, established 1956, near-pristine esker forests shall remain under free development.